Sunday night in Rome four children died in the fire. At the time of the tragedy they were alone, because their mother had gone out to find food and the aunt was looking for water. The four children have died in the fire because, to fight the cold winter in their wood and plastic house, they used a brazier. This is a way to explain it, but obviously that’s not enough. These poor victims need more than that, don’t you think? "The popular houses have their own ranking and who speaks today of houses to Roma people want to leave them in those ovens. Today we have to deal with the emergency and ensure safe conditions for people," Gianni Alemanno replied to whom proposed home accommodation as a solution. Alemanno is the Mayor of Rome. Rome is the town where four children were burnt to death last night. "We will ask the government special powers to the prefect, giving him the chance to skip the conference services that slows down the paperwork," Alemanno said as a first response to what happened. "We can not allow people to continue to live in made of plastic shacks. I intend to hold a day of mourning and to choose the date according to the will of the family. We will ask the Civil Defence to build shelters to clear the micro squatter camps and cabins of death," he added as a corollary. Does he still want to clear people?! my name was Sebastian and I died at eleven. Luckily for me I was not alone when I'm gone. It's never nice to die alone. Unluckily those who have left with me were the people I loved most in the world. Patrizia was eight years old. The smallest, Raul, was only four. How much can destiny be cruel, don’t you think? The fire, the precious fire in the winter nights that was the fifth brother to us, the most important one, even more than me that I was the eldest, the one that should never fail when you need it, betrayed us. Only heaven knows how much we need to heat when the sun goes down, in your hometown. Or maybe you know, as well as your fellow citizens that are more fortunate than us. Well, only those less favored by luck must live with the risk to have a friend like fire. That is a friend that can take four away from the world in one night. Yet, you look like those flames, you know? You too, as them, should be here to help. You are the Mayor; you should be the best friend of your countrymen. We were among them, you like it or not, if your supporters like it or not. You are the first citizen, isn’t it? However, as the fire that burned in that brazier, you too have the moment when you get too excited and decide to wipe us out. I finished my trip at eleven years old, but some of the latter I've lived on my skin and I remember them all. 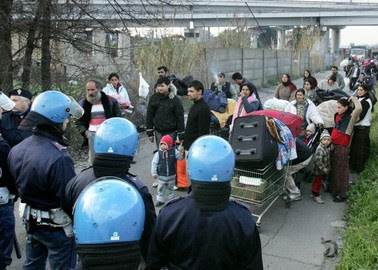 The News: Four Roma children died in a camp in Rome.